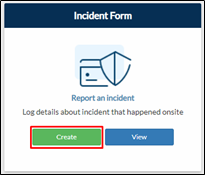 Project Page – Click Risk Management tab > Create on Incident Form tile. Search Bar – Type Incident Form then click the result. Navigation Bar – Go to Risk Management > Incident Form. 3. Select the Type of Report you want to prepare. Note that the displayed fields will depend on your selected type of report. 5. Sign the form below.